Volchaos is the latest title from Fun Infused Games, who have brought us such gems as Hypership out of Control, Nasty, Abduction Action, Trivia or Die and Hypership out of Control. Yeah, I said it twice. It’s that good. Anyway, for long enough they’ve been delivering gems to you. Now it’s time for you to do some work and collect the things for yourself. Collecting gems isn’t the main aim in Volchaos but in one of the many hilarious pre-level slides, you’re informed that you’re trying to pay off your mortgage. It’s as close as the game comes to a plot beyond oh God, lava, run! so, well, you may as well collect them, eh? The intention is to include bonuses for anyone that can collect all the gems, though as yet the exact nature of these is unknown. What would you like to see as a bonus? Personally, I’d like Fun Infused Games to pay off my real-life mortgage if I get all the gems. 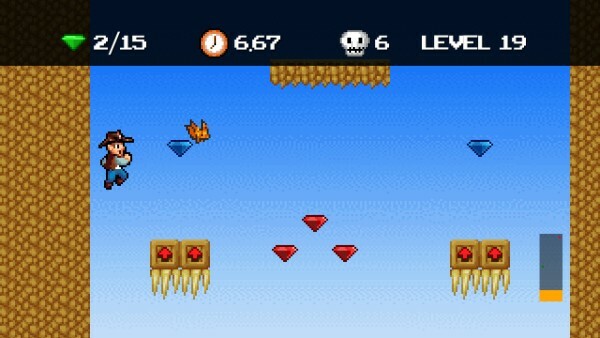 So, while collecting the gems isn’t the main aim, it’s still something you’ll want to aim for. The main aim is, well, it’s to get the hell away from that lava. Volcanoes are quite dangerous, it seems, and for every second you’re in them the lava has a tendency to rise. And rise. So your job is to get to the end of the level before the level sees the end of you! Like what I did there? This makes for some brilliant, tense platforming as you run faster than you’d like to the end of each short level, deciding whether or not you’ve got time to collect all the gems on the way. Then, once you’ve got to the end of the level and beaten it again to collect all the gems, there’s a sudden compulsion to beat it again, but faster. Really show that lava who’s boss. You. You’re the boss. That was you, getting burned up by the lava again. The lava is the boss. Sorry. I’ve been really enjoying Volchaos, and absolutely my favourite thing about it is the level design. It’s something that was wonderful in Hypership out of Control, too. In that game, there would be something leading you to one part of the screen before you realise that you’ve been tricked and actually all the good stuff is on the other side of the screen. Level design like that is just hilarious, and Volchaos raises its mockery of the player to new extremes. 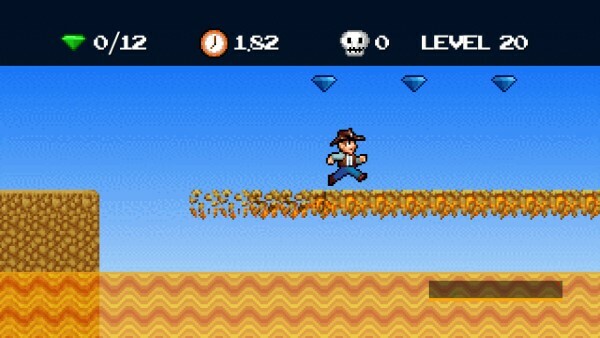 In one level, you start towards the finish and have to circle the level to get back to the end. Carefully, carefully you’ll travel and just when you think you’ve got it, you’ll jump on a spring-box towards the finish flag, get ready to enjoy a victory dance, and then smash into some spikes that you could have seen in the beginning but simply hadn’t noticed. Then you’ll laugh, because you realise how great the design is and how it totally got you. With various enemies, moving platforms, springs, collapsing platforms and various other bits, there’s plenty of scope for the game to have you in a gibbering mess on the floor by the time you’ve finished the planned forty levels. Then you’ll do it all again. Of course, a game like this will succeed or fail based on how it feels. If the platforming doesn’t feel spot on, it just won’t be fun to play and it certainly won’t be fun to keep improving and improving your times. Luckily, it’s great fun at the moment and it’s something that Fun Infused Games are constantly tweaking – it won’t be released until it’s perfect and rightly so. Volchaos is still in development, and will hopefully be out in the next few months! Hedge Wizard, on the way from Zombie Bonsai, is a cute looking puzzle game unlike any I’ve played before. You play as a wizard, sort of. You really want gold but, being kind of lazy, it’s much easier to get the local peasants to just bring it to your tower for you. So, you control a local peasant who moves with the left stick, and cast spells from the comfort of your tower. The goal in each level is to ensure that the village is safe, collect the gold, and then walk over to the wizard’s tower with it. This all sounds simple enough but there’s just so much that can destroy a village. Fire. Floods. Wizards accidentally reducing them to rubble. It’s tough, being a village. Luckily, if the village gets destroyed (or you find yourself otherwise stuck) you can just tap LT a few times and it will take you back in the timeline to certain points such as the moment just before you cast a spell, find a point you’re happy with and simply continue your solution from there. Saving villages is done by casting spells in the local area. For example, an early level has two areas of forest separated by a dried up river. On one side is the village, on the other is a raging fire. The fire will spread and cross to the other side and burn the village down unless you cast a water spell in the river to stop the fire crossing. 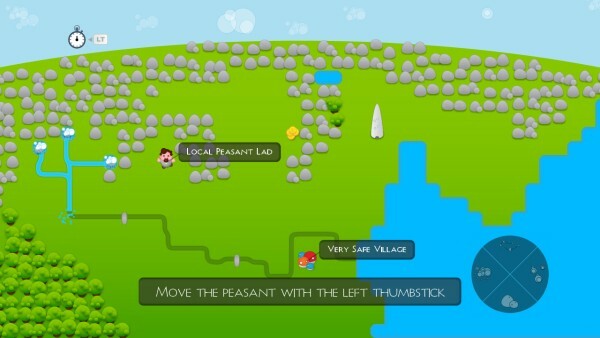 And you should, because the peasants won’t want to give you their gold if you haven’t saved their village. Sometimes you may need to cast more than one spell depending on how quickly you need the water to flow. Spells are collected by the peasant and cast with an on-screen wand pointer, which is controlled with the right stick. 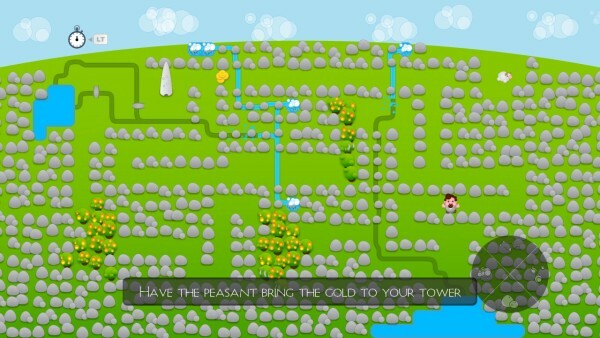 Once the village is saved in the above example, just grab the gold and take it to the tower. That’s a simple example, but later you’ll be casting all kinds of different spells. You’ll have no water spells so you’ll have to use wind spells to blow rain clouds around, or move rocks with an earth spell. Sometimes, it’s not enough just to save the village, too. A puzzle might have a very simple solution but then as you’re making your way to the tower you’ll realise that a river has filled up and barred your way across. Back in time you go, and try again. It means that there’s always something to think about, and it does something that all the best puzzle games do: it lulls you in to a false sense of security. Just when you think you’ve got something solved, you find something else that you hadn’t considered and you have to go back and start again, or in this case, just go back as far as you need to. Hedge Wizard is coming soon to Xbox LIVE Indie Games. And not a sign of David Bowie. Labyrinth, from Subtle Abberation, is the story of Amelia, who finds herself trapped in a labyrinth with no memory of how she got there but a knowledge that she has to travel deeper towards a huge black tower, which you can see at the end of the trailer below. In addition to having really nice looking environments, the game also has a really interesting way of revealing its story to the player. The story is slowly revealed throughout the game in the form of collectible journal pages and loading screen dialogue. Gameplay is a combination of exploring the depths of the Labyrinth, and solving the puzzles that you encounter throughout. Achievement Locked contacted the developer to see what else we could find out about the gameplay, and what kind of puzzles the player might encounter. In the first level, you reach a small forested area where a series of gates blocks your progress. On the cliff face by each gate is a large symbol. Simply find that matching symbol in the forest and walk over them in order to open the gates. The second level is completely different, and requires simple exploration until you find a series of small bridges suspended over a small forest. A tall tree stands at the edge, and your goal is to knock it down and use it as a bridge to continue your journey through the Labyrinth. You’ll face something new in each Labyrinth itself every level. Dangers like thorns, traps, and enemies will threaten your path, and creatures, waterways, and gates offer other puzzle options. Labyrinth is finished, and is just going through a bit more testing before its release within the next few weeks.